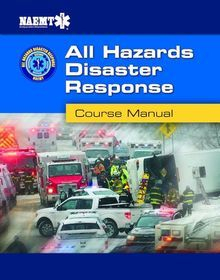 All Hazards Disaster Response - AHDR is a classroom, PowerPoint, Scenarios, instructor-led course from the National Association of Emergency Medical Technicians that prepares and focuses on EMS practitioners at all levels and arenas to respond to the many types of disaster scenarios they may encounter - Floods, Tornadoes, Terror Attack, Active Shooter, Earthquakes, Bus Wrecks, Terror Attacks, and etc... It teaches students how to analyze potential threats in their area, assess available resources, and create a response plan that will SAVE LIVES. At the start of the course, students conduct a "Hazards Vulnerability Analysis" (HVA) to assess features of their environment, both natural and manmade, that pose risk, along with assessing the needs of vulnerable populations, such as Personal Care Homes, Assisted Live Homes, or Hospitals that need special consideration during such an event. Foundation is built on the Four Emergency Management Principles - Prepare, Mitigate, Response, and Recovery - with a focus on Response. AUDIENCE: This course is for EMS, firefighters, first responders, rescue personnel, and safety officers and can be customized to fit the specific needs of the participants, including geographic area. Content is presented in the context of realistic scenarios, culminating with a large-scale mass casualty activity. COURSE FORMAT: This classroom-based which includes instructor, PowerPoint, video, and realistic scenarios interaction throughout the course. This course is approximately 8 hours in length. PowerPoint-based course to ensure continuity, consistency, and "out of the box thinking"
CERTIFICATION: Upon completion of this course, students receive a NAEMT Trauma First Response course certification and completion card that is valid for 4 years.